Projection Screen | San Diego Kids Party Rentals | water slide and bounce house | San Diego Kids Party Rentals | bounce house rentals in San Diego and Rancho Santa Fe, CA. Self-Standing Screen for rent by San Diego Kids Party Rentals. Please note the self standing screen is just a screen by itself, with no projection or audio. 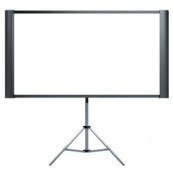 Works great for a meeting room setting, presentation or a small area needed for an outdoor movie.